Since my last update on the garage build I have managed to make some progress in the gaps between work and holidays. 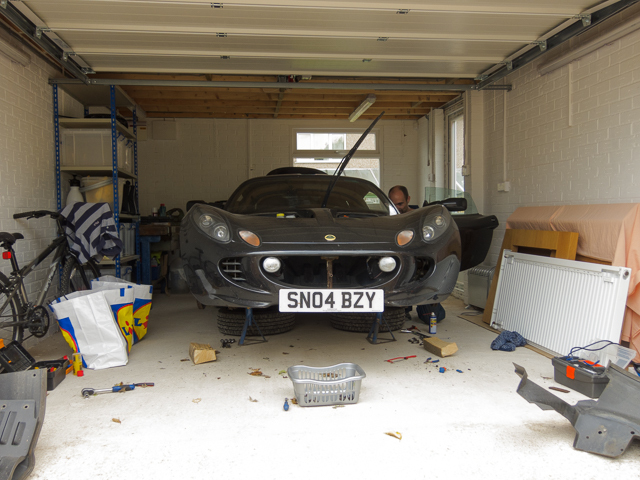 The main task was to empty the temporary garage, aka the dining room, which needs to be plastered and redecorated before Christmas. This involved refurbishing Jen’s Granddad’s workbench (which we are sure he acquired from the Alvis factory, where he worked), erecting shelving and having a thorough sort out of everything we had kept from the old garage. Although I still need to sort out tools, as I have inherited my Dad’s collection to join Jen’s granddad’s and my own – which seems like a good excuse to get a shiny new toolbox! Now that the garage is full of car and tools etc I’ve upped the security with better locks and an alarm. 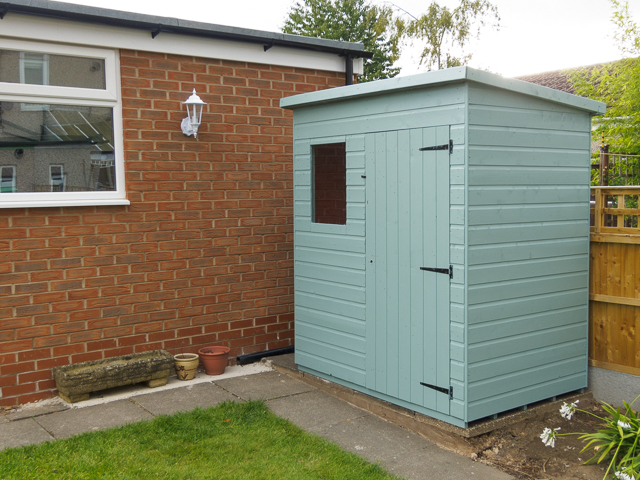 The shed isn’t strictly related to the garage build, but as one of the most important requirements was that the garage would be for car stuff only, we needed a shed for everything else. Last weekend we had a shed building BBQ, with my friends Partho, Rich and Vernon to help with the construction and Jen, Anna and Jo keeping us fed and watered. The shed went up fairly quickly between rain showers, but we weren’t able to get it painted until this weekend. Jen chose the colour (Seagrass by Cuprinol), which I think looks really good after a couple of coats. The garage is finally ready to park a car in! This picture is actually a few weeks old, but life has been a bit hectic recently, so I’m playing catch up on the blog. A few days after the door was fitted Martin, our electrician, installed the fuse board and connected up the garage door motor, so I could get the car in and out. The tricky bit now is working out how to connect it up to the alarm which he is going to fit, so that before the door opens the alarm is deactivated. It has been a bit quiet on the garage front recently, we’ve mainly been painting the inside, but this weekend the door was fitted. 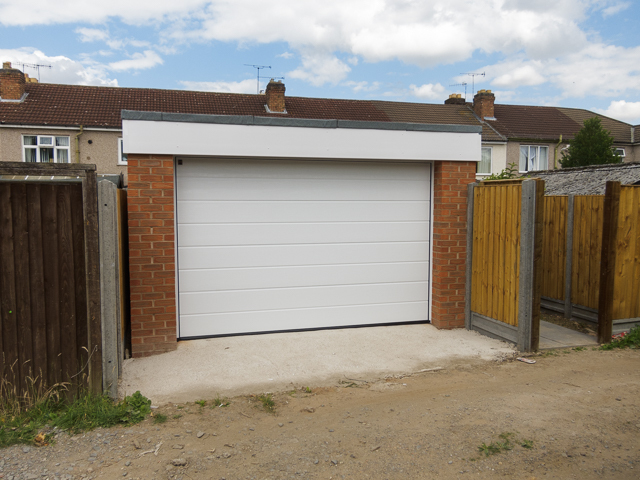 I went for a Hormann sectional door with motor, expensive, but hopefully worth it. I also got the trench for the electrical cables dug today – hard work in the sun, but my fault for leaving it until the last minute, as the electricians are starting tomorrow. This means I will be able to open and close the door, without an extension lead from the house in the middle of the garage. 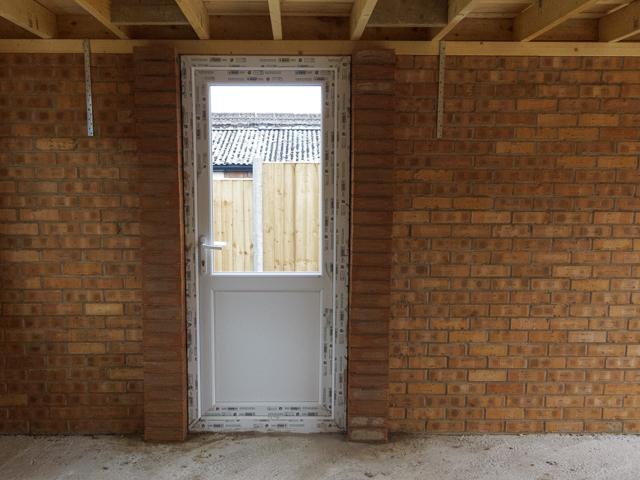 An internal picture today, as the piers either side of the door were the last bits that the builder needed to do, so nothing has changed outside. The pace of work (and frequency of updates) will slow down a bit now that it is down to me to do the work, but the next task is to paint the walls inside the garage white, to keep the dust down and make the garage a bit brighter. The door has been ordered, so that should be installed in the next few weeks, which means we will be able to get the electrician in to finish the wiring and then I’ll be able to park the MR2 inside! The garage is almost finished! 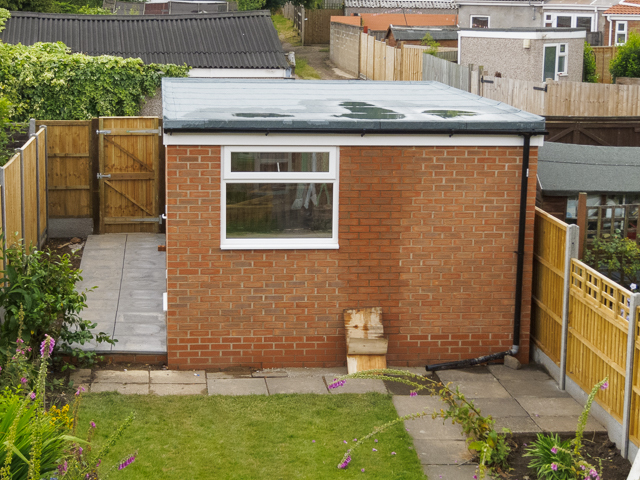 The last slabs for the path have been laid, along with the shed base and the garage floor. 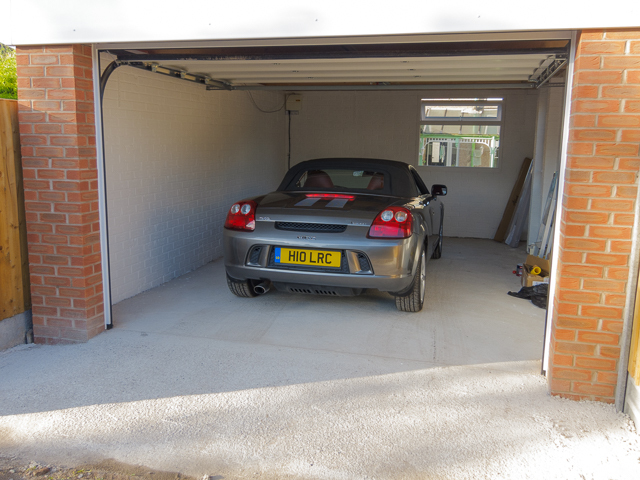 When the concrete floor is dry, the builder needs to build some supporting pillars for the door and then he is finished and we can start with the remaining jobs – the interior fit out, getting the garage door and electrics installed etc. Now that the facias, window and side door (minus bottom panel) are fitted it looks a lot more complete. The path down the side of the garage has also been started, although we’ve ran out of slabs, a combination of not ordering enough and some breaking when they were laid. I’ve been told the concrete floor is going down on Friday, so I really need to hurry up and get the garage door ordered. I didn’t post yesterday, as the visually there wasn’t much different from day thirteen, as it was just the carpentry that had been finished off. However, there has been more progress today, the roof has been finished and the eagle eyed amongst you may have noticed that we also have a new fence and back gate. 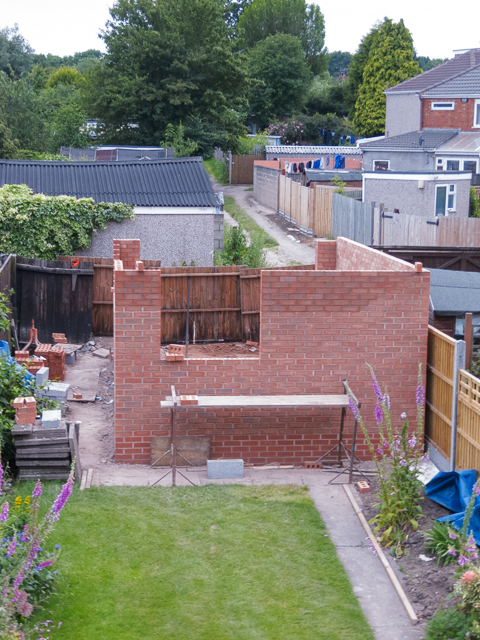 The brickwork for the walls is now complete and work on the roof has started. The wall plates and joists have been fitted and the boarding is about half done. The roofer will finish off the roof on Tuesday and the window and personnel door will be fitted on Wednesday. 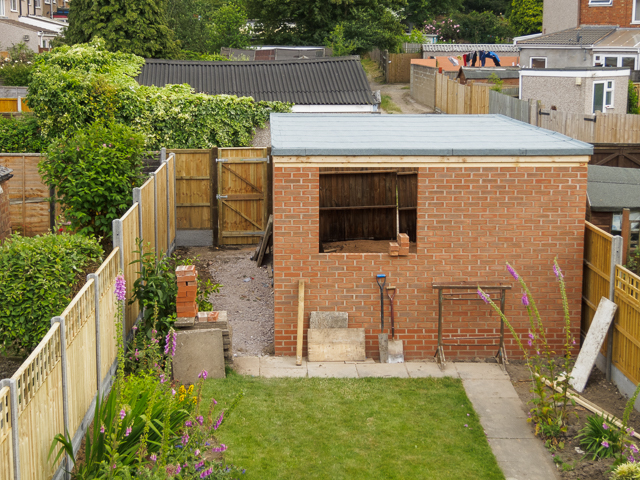 Work has also started on the path down the side of the garage and the base for the shed. The next step is to fit the steel lintel above what will be the garage door. Whilst I was at Le Mans (blog to follow seen) the builders made good progress, with three sides now at full height. 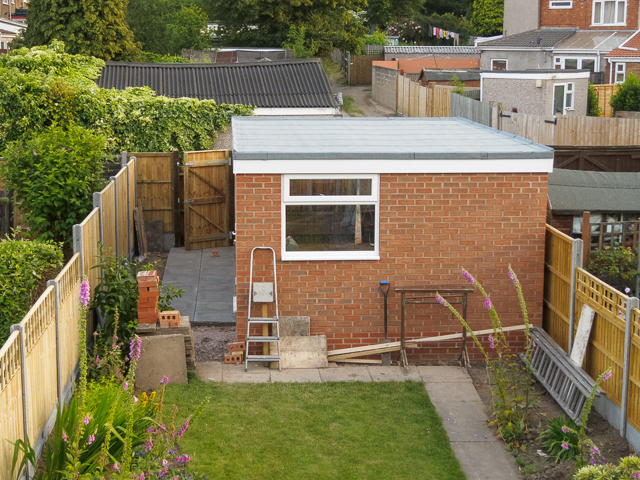 Due to the slight slope of the garden the garage looks higher than I was expecting, but my plans were based on the garden being flat. 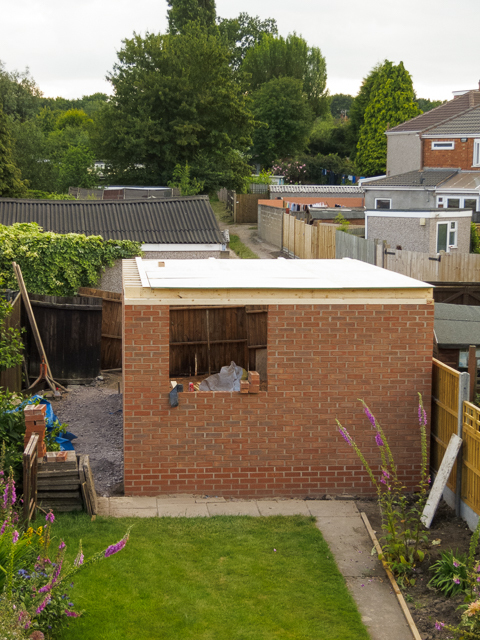 We are still on schedule for the roof to be fitted this week, at which point it will start to feel more like a garage.